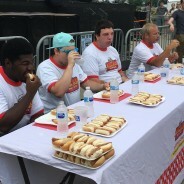 – To win this challenge you must break the current hot dog record. – As of 4/2/2019, the current record is 50 hot dogs (so you must eat 51). – There is a 30 minute time limit to finish and break the record. – Click here to check out the restaurant’s challenge page.